Ohio needed to have a good start against Virginia, its final opponent in the West Palm Invitational. The Bobcats started well and scored 28 points in the first quarter Sunday, the highest-scoring first quarter they’ve had all season. The quality start, though, was flattened for the rest of the game. Ohio was outscored 41-14 in the second and third quarters, and it lost 77-59 against Virginia in Countess de Hoernle Student Life Center at Keiser University. “It was nice to see them respond from a tough loss the night before and just really come out and shoot it, and played with a lot of confidence,” coach Bob Boldon said. Ohio was coming off a 70-68 loss against Furman in which guard Le’Jzae Davidson hit a 3-pointer with 0.7 seconds left to give Furman the win. That was why the Bobcats needed a good start against the Cavaliers. How the Bobcats responded would be important, especially considering the Cavaliers were just as good a shooting team, if not better, than the Paladins. The Cavaliers shot 50 percent from three. Despite the Cavaliers’ overwhelming size, which included 6-foot-9 center Felicia Aiyeotan, the Bobcats weren’t at a significant disadvantage at the outset. They only lost the rebound battle 10-6 during the first quarter, and their defensive intensity was as high as it’s been. The Bobcats forced the Cavaliers to commit five turnovers in the first, and they had four steals. The rest of the game was different, though. Aiyeotan and the Cavaliers’ size became a factor, one that the Bobcats struggled to overcome on offense. Ohio scored six points in the second quarter, its lowest-scoring quarter this season. “The last three quarters were not as good, and we’ve got to try to get that stuff worked out,” Boldon said. Ohio, a program that’s won 20 or more games for the past three seasons, is not used to losing this many games early in the season. For the past three seasons, the Bobcats (5-5) have not lost more than three games in their first ten games. Ohio has had a tough non-conference schedule. It has played three Power 5 schools – Michigan, Purdue and Virginia — in ten games, and it only defeated Purdue. With only one game left in non-conference play, though, Boldon knows his team is running out of time to fix its problems. 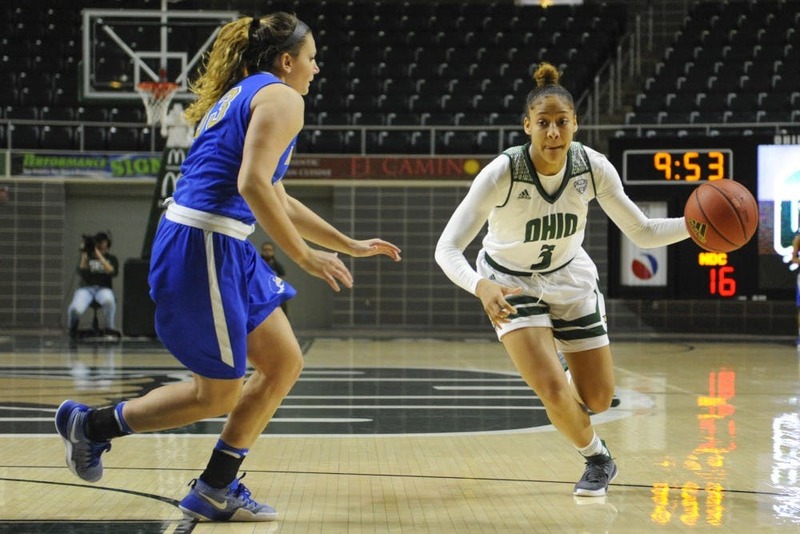 Ohio will start Mid-American Conference play at home Dec. 31 when it plays Toledo, the reigning conference champions. The Bobcats are on the back end of non-conference play, but they’ve still grown throughout this tough schedule. The offense has shown steady improvement, particularly when Ohio shot a season-high 62.5 percent from three against Purdue. Throughout the season, growth has been the story, particularly because this team is so young. Five freshmen are on its roster, and three of those freshmen — Cierra Hooks, Gabby Burris and •Alexis Stover — have earned consistent minutes in Boldon’s rotation. As Ohio comes off this game, it will have a break before its last non-conference game; Ohio will play North Carolina A&T at home Dec. 28. Perhaps this break will only help the Bobcats continue to grow. “We’ll come back and get one more in before conference play starts, so I’m anxious to see how it goes,” Boldon said.